Save your old soap scraps, melt them down, and pour into Play Dough molds or candy molds or specialty ice cube trays - even just pour onto a cookie sheet. If using a cookie sheet: when the soap has hardened somewhat on the cookie sheet, cut out shapes with a cookie cutter to add some fun to your child's bath time. If using molds: just pop them out once the soap is completely hard. An older child can have fun cutting out the shapes themselves. 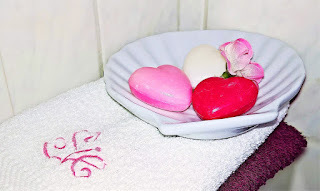 For longer use, let your new soaps harden for a week or two before using.